A Few Hours on Christmas Eve . 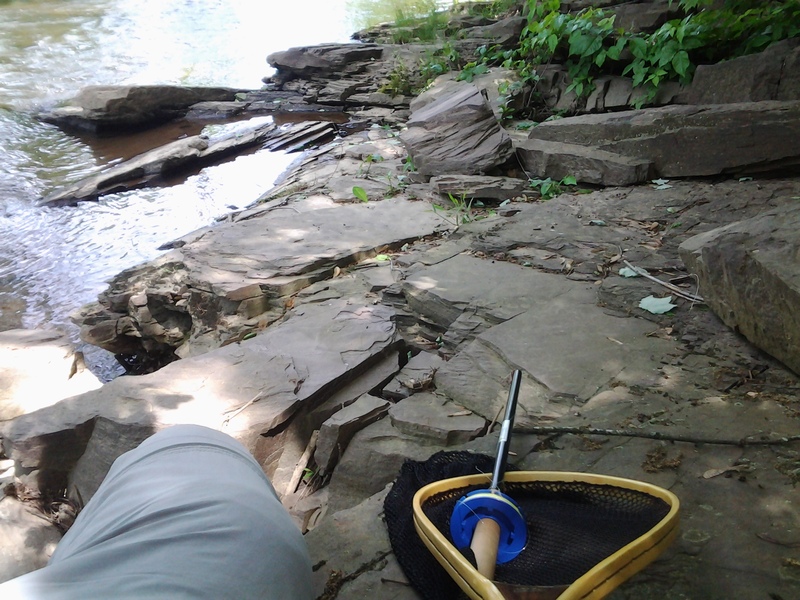 . .
My 2012 fishing year, my first tenkara season, ended along the same water where it began: French Creek in southeastern Pennsylvania. My Christmas Eve had been planned from early afternoon onward – situated at the in-laws, gift wrapping, attending services, dining on a meal of seven fishes – which offered me one last free morning of trout fishing if I wanted it. Silently I departed from a slumbering house after coffee and a cinnamon roll. Outside, the damp December air filled my lungs and legs with awakening. Frost crusted the grass as a thin overcast filled the still sky. Snow was in the evening forecast. The solunar table predicted a Major between nine and eleven a.m. Perhaps a few little caddis, as well as a few following Salmo trutta, might brave the morning calm along with me. French Creek, just a few downhill minutes away on foot, flowed clear and low. Large knots of exposed oak and London plane tree roots broke the opposite bank every few dozen yards. These tangles can always provide some depth and holding lies where delineated pool and riffle structures are not present. A small Pheasant Tail nymph shortly found itself drifting by these pretzel patterns of wood. My casts were smooth and hypnotizing. Chatty crows flew by and chickadees made friendly calls from nearby branches. One polite slate blue and white nuthatch appeared on a nearby tree trunk and softly said: “Hen. Hen. Hen.” in a way that resembled advice on where to cast. The big take of the outing came soon after, slowly, more of a stop in the flow that felt at first like a flexible snag. A tree branch, submerged, must have hooked up with the pattern, I assumed. My response was a kind of lackadaisical pull back. The resistance pulled forth. When the back and forth symmetry abruptly turned into asymmetric animation, I realized the other end held a fish. 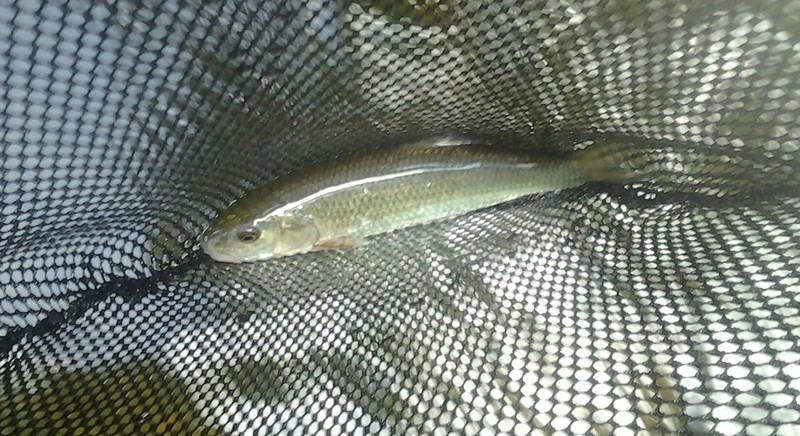 A flash of bronze and silver flashed from below and then I was snapped off a decent brown trout. I was not used to the new 6x tippet material I had employed, or maybe my knot had frayed on a root. Upstream called to me then. One large flat pool with some depth lay a few dozen yards above the bridge just in view through the brown web of bare trees. I hiked up to it, passed beneath the span on a narrow band of frozen mud. I then faced my athletic challenge of the day. I had to climb along a scree of red siltstone that is near impossible to navigate when the full growth of summer is present. I angled myself parallel to the steep side so a slip would simply land me hard onto the loose rock rather than on a neck breaker of a tumble into frigid water below. Tenacious thorned vine branches nagged at me as well, but I made it, climbing down to the water on a natural staircase of the red rock beside which a sapling bannister stood. While I scanned for risers and contemplated the water’s sound and motion simultaneously, I heard rhythmical wind sounding from above. A great blue heron passed overhead with an audible flap of broad wings. Its prehistoric profile approached a series of power lines that stretched across the creek about twenty yards farther up. One of the cables must have been strung a few feet higher than the others. The big bird had to add an extra jump to clear the hump. Loud croaks followed, an ornery sound reminding me of any other pissed off commuter faced with an unexpected obstacle. No risers appeared as the clock continued toward noon. I tipped my leader with a Gold-Ribbed Hare’s Ear nymph and swung it a few dozen times. No takers. 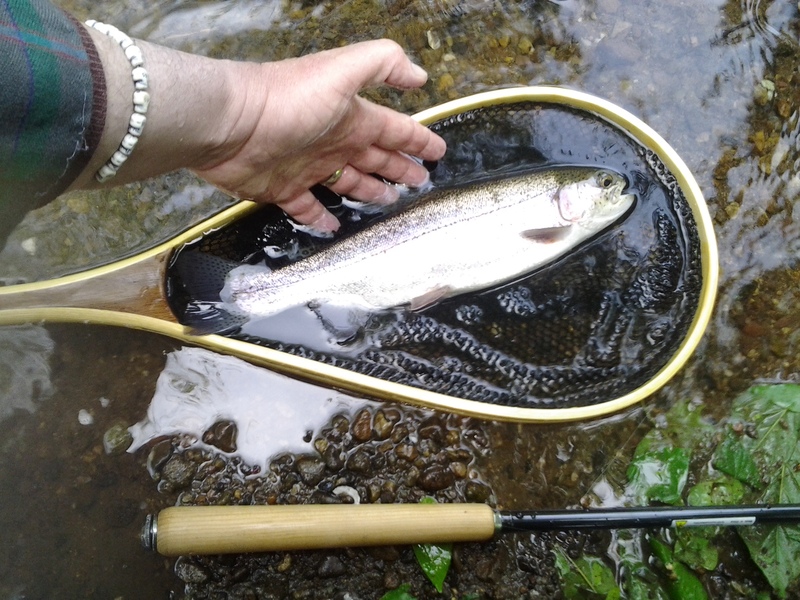 I was pleased, though, to have had a few hours before the holiday that were removed from structured stress and inserted instead into the random natural world of wind in the ears and water before the eyes and the thought that my fly attached to a tenkara rod might present me with a Christmas gift of a trout. As it happened, I received a present even more grand – one of presence, pure and uncomplicated – one of happiness. Kendo Meets Tenkara . . . When earlier I addressed the theme of all things Japanese, the one that has paralleled the course of my life, I omitted a single important example, which I wanted to save for this, the proper moment. My wife, Maryann, has also cultivated a close relationship with the culture of Japan. When we met, during the wedding day of a mutual friend, we discovered we both had an affinity for the Japanese that went far beyond food. Her primary connection turned out to be the martial art of kendo: the way of the sword. Best described to the uninitiated as Japanese fencing, kendo is a fascinating, beautiful, and artful approach to swordsmanship, or kenjutsu. When I first visited Maryann’s Manhattan-based dojo, Ken-Zen Institute, I found her and her fellow students, or kendoka, to be serious, even reverent, during study and practice. Under the tutelage of their sensei, Daniel T. Ebihara, Kendo Kyoshi, 7-Dan, each class first divides into two sides, which face each other and follow a series of exercises: a contemplative warm-up; kiri-kaeshi, in which strike centering and stamina are cultivated in successive turns; and wazo-geiko, when kendoka learn and rehearse techniques with a designated partner. 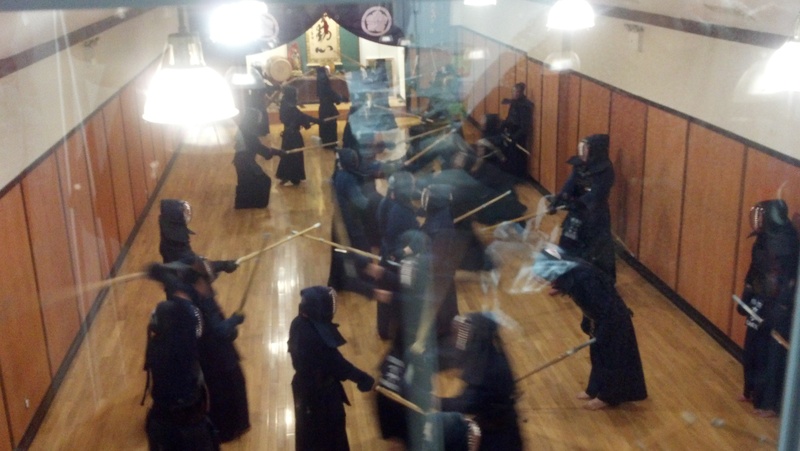 What follows is the dramatic peak of a kendo class. Kendoka suit up into full body armor, the distinctive indigo bogu, which is necessary for Ji-geiko. This part of kendo employs undirected practice in which all assembled fight one another at once. The dojo’s floor, polished wood similar to a basketball court, resounds with the barefootwork, fumikomi-ashi, combined with the collective kiai, the emotional vocal unleashing of the fighting spirit. When this part commences, the experience can be rendered in words as a human eruption. The violence of the sound and controlled chaotic motion of the combat produce a visceral effect in the third-party viewer, an effect that reminds us that kendo is battle. 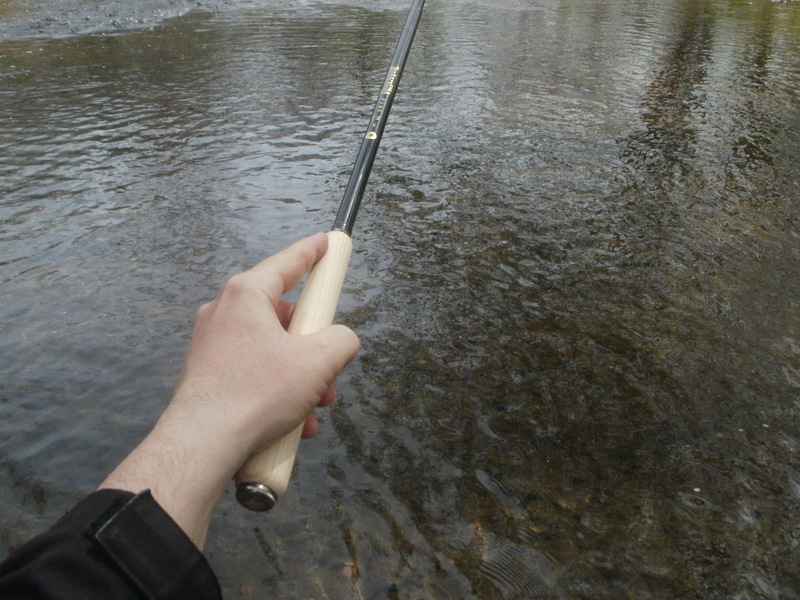 Conversely, my practice of fly fishing is commonly called the quiet sport. I was delighted, then, when Maryann not only expressed an interest in trying my way of the fly rod; she actually found she liked the experience. The 5-weight, in particular, appealed to her. The structural logic of the rod, this fishing tool, neither intimidated nor baffled her. 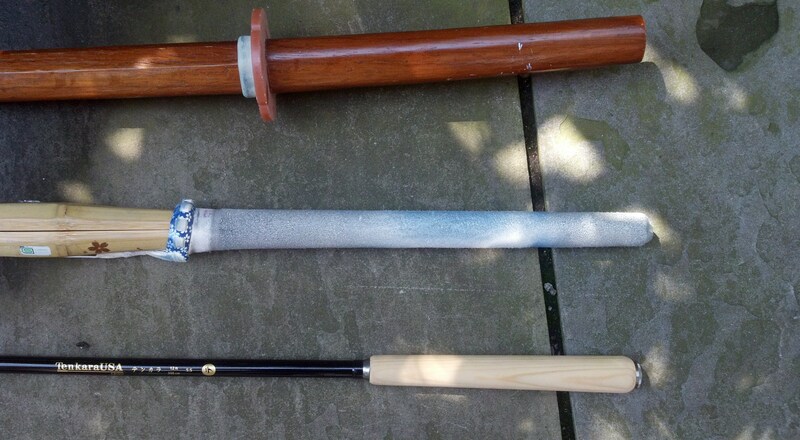 Several years of study with the bamboo shinai translated into an easy transition to the fishing instrument. She was, to use the phrase, a natural. We were married a few months later. I moved to New York City to join her. We have since fished freshwater and saltwater, warm water and cold water, lakes and ponds, rivers and streams. 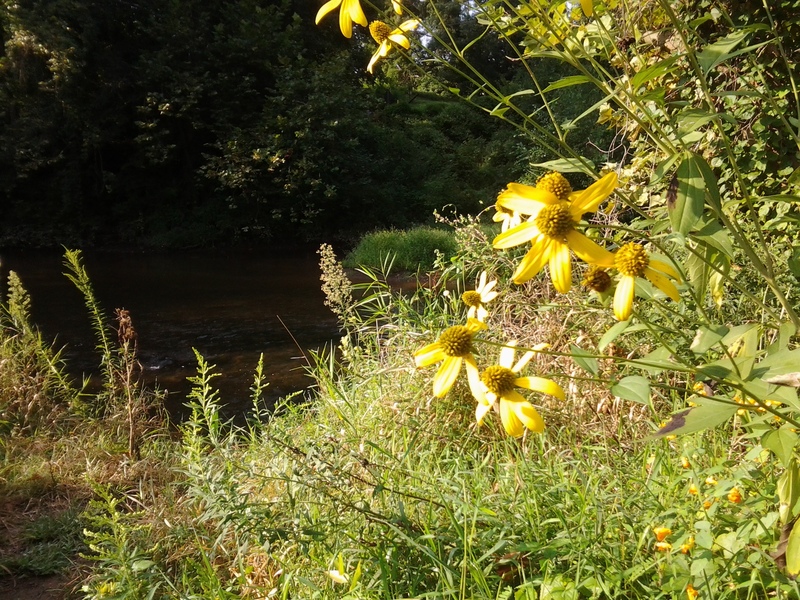 Whatever the fishing situation, we seem to find ourselves on the same side of the bank. We are more than life partners; we are fishing buddies. 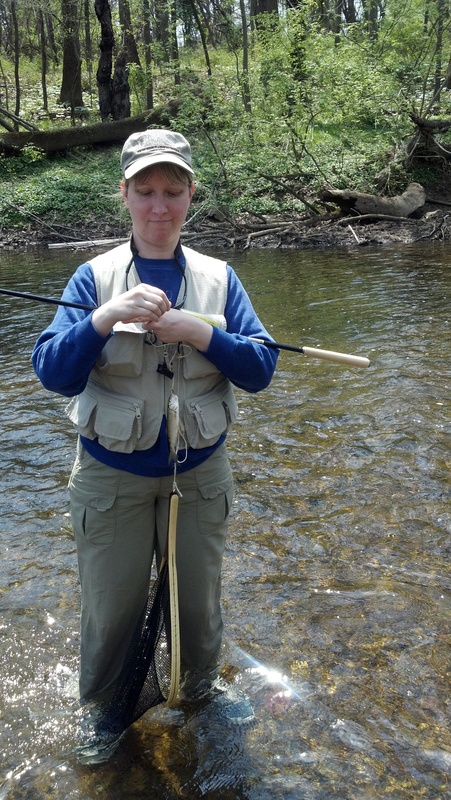 Last year, when tenkara began to appear again and again on my online angling reading radar, Maryann encouraged me to learn more, to purchase a rod, and then to learn even more together with her. She liked the symbolism embodied by a Japanese sword and a Japanese fly rod residing under the same Manhattan roof. I agreed, but waited until the spring of the year, mainly so we could jump right into the experience after receiving the equipment. 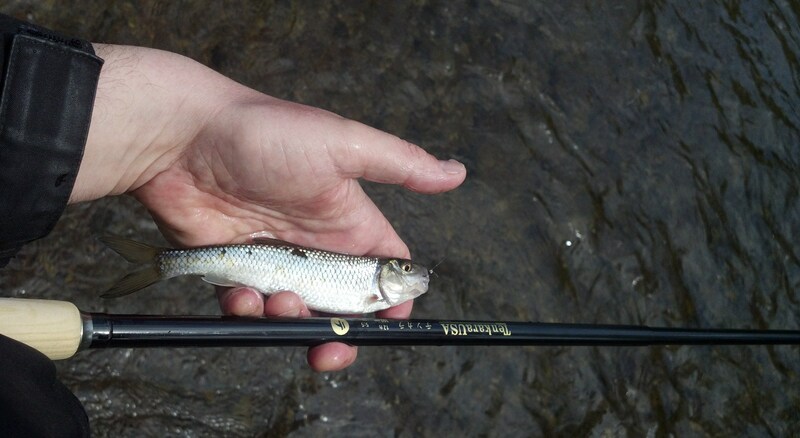 The simplicity of the tenkara rod, especially the fact it supports no reel, continues to feel fresh to me, yet it has a familiar appeal to her. The red pine handle of our Ebisu model, in fact, resembles the tsuka of a bamboo shinai and hardwood oak bokuto. 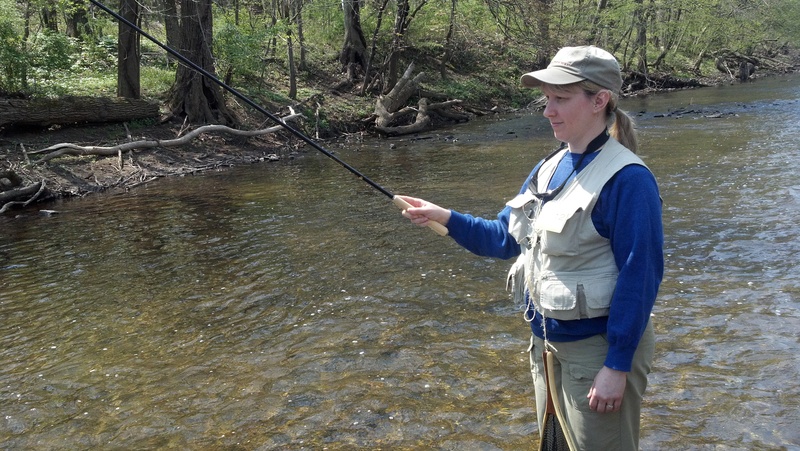 Recently, we spent Maryann’s birthday weekend in southeastern Pennsylvania with her twin brother and parents, who live just a few blocks from French Creek, a freestone stream suited to the tenkara rod and method. The flow averages between thirty and forty feet in width along its main stretches. Several riffled areas, bends, and chutes narrow down to ten to fifteen feet. 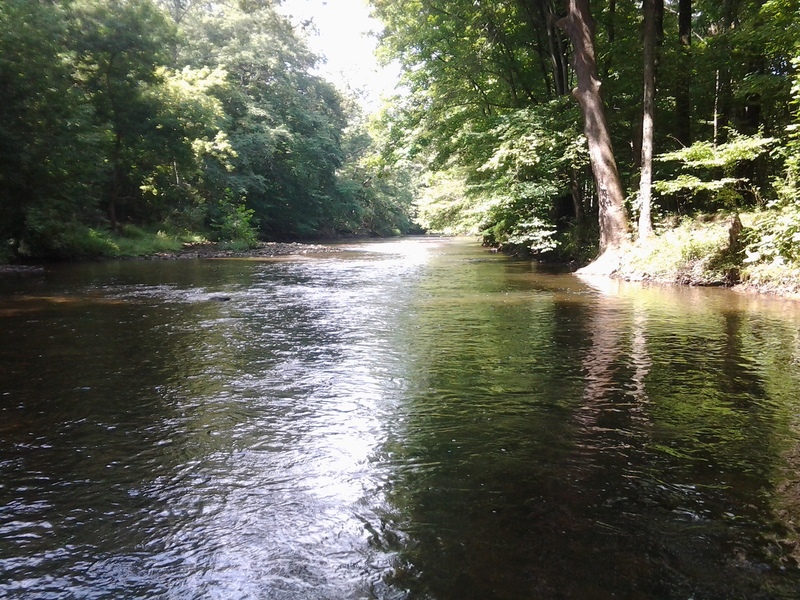 Here there are brown trout, some smallmouth bass, and one of my favorite fly-friendly species, fallfish, perhaps the gamest member of the chub family of minnows. 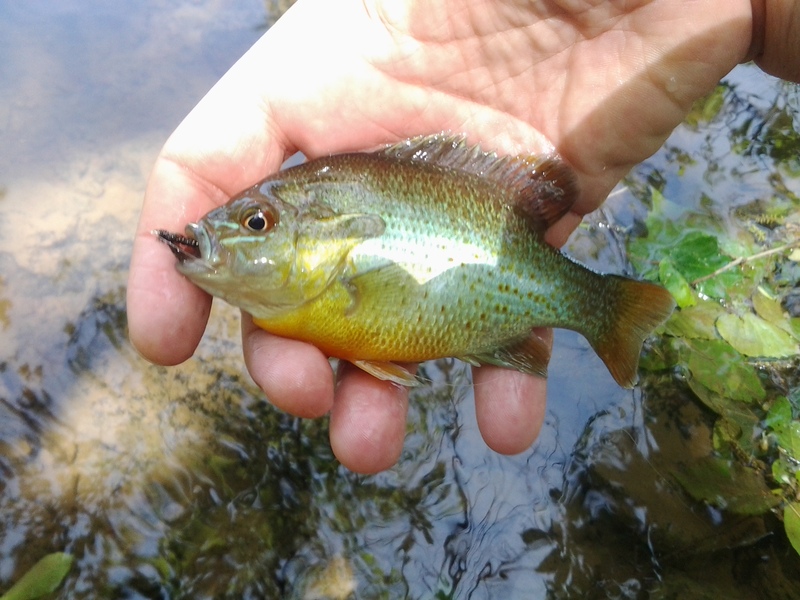 The fallfish averages between six and twelve inches in length and, being insectivorous, makes a great fly rod quarry. Once hooked, a fallfish will fight hard like a baby tarpon, a fish which it actually resembles, albeit one that is one-thousandth of the size. 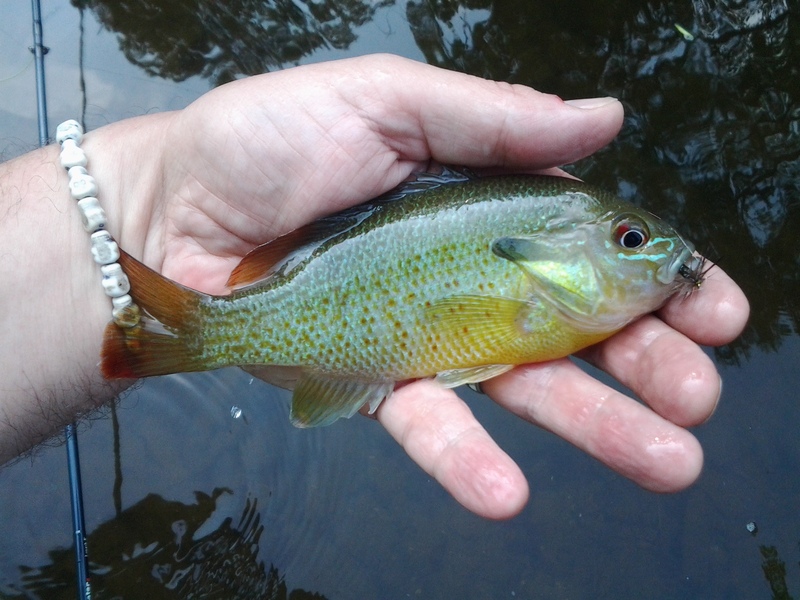 Fishing the tenkara along French Creek created a pleasant experience. The casting proved to be easy and light. We both found the long rod and level line could swing an Amano Kebari or a soft-hackled fly into the kind of small bathtub depressions found in front of fallen trees and behind projecting stones. Tiny pools like these often hold all the catchable fish in shallow stretches overlooked by spin fishers who require greater depth. The result, then, is more fish for the fly fishers, which during our weekend included brown trout, common shiner, smallmouth bass, and fallfish. 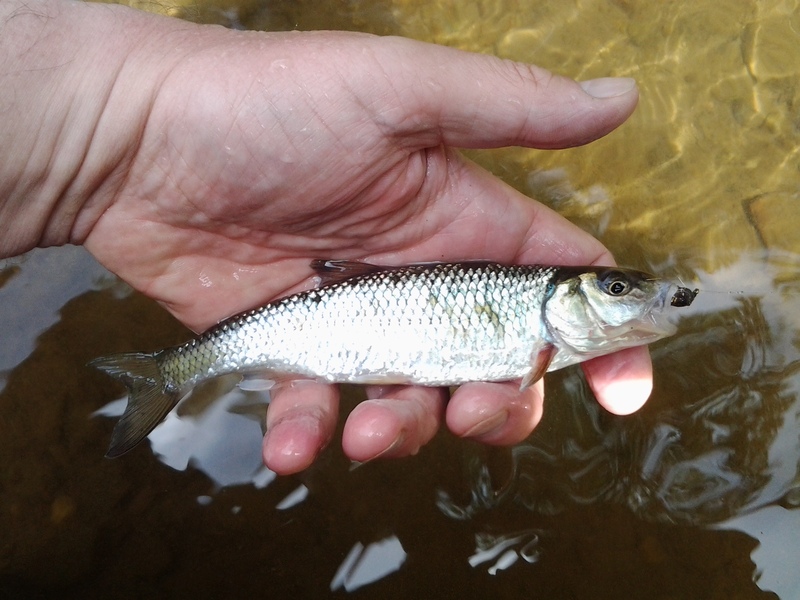 A small stream, a simple rod, a single fish: these three can become one under a rising spring sun.